We offer full service installation of piling wraps for new and nearly new pilings that are not yet damaged by wood boring worms and other parasites. The installation will be done by either scraping or pressure washing the piling clean of any barnacles, mussels and oysters if needed. It will then be wrapped with an inner barrier and then covered in our UV protected PVC outer jacket that will cover the piling from just below the mud line to above the extreme high tide line, this will prevent oxygenated water from entering the wood piling. Without this water flow wood boring worms cannot survive. The UV protected PVC jacket will be affixed to the pilings with 1 1/4 inch ring shank, stainless steel nails and or other methods deemed effective for your area. The method chosen will indefinitely withstand saltwater conditions. This system has been a proven method of preservation for more than twenty years. If your pilings show damage from years of wood boring worms and parasites attacking them, we can restore them to a condition as strong, if not stronger than new. It is a safe effective restoration process in which concrete mix is poured inside the PVC tube. Within 24 hours later, the concrete heals revealing a perfectly restored piling. The concrete restoration system utilizes a heavy duty UV protected PVC jacket with a large 4′ Tie wrap every 10 inches or stainless steel nails every 6 inches. Concrete is then poured filling into the jacket, filling all the voids left from years of worm and parasite damage. WHY WRAP INSTEAD OF REPLACE? Pile wrapping is a cost effective way to protect and preserve your waterfront investment. 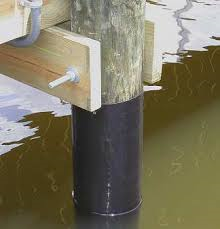 It is a great option to extend the life of older docks and piers with piles that are due for replacement. With the cost of pile replacement ranging from $400 – $600 a pile and up, our system can offer significant savings to waterfront homeowners and businesses alike. Please contact us to receive a FREE on site estimate for your project.